Your Next Stamp is hosting a challenge over on their challenge blog. It's the very first one so be sure to enter and help them kick off with a bang! You know how I love to support challenge blogs. :) This first challenge is to use Pink and Yellow! I love pink and yellow so it was an easy one for me! I used this adorable Fhiona for my card. I love Fhiona, she's so cute! This set it called Just Swimming By Mermaid. I colored her in and gave her some Cotton Candy Stickles for her bikini top. The DP is from Target's $1 spot. The "hi" is some alphabet stickers. Hope the Your Next Stamp girls like my card for their challenge! I love it! The mermaid looks so cute in pink and yellow! Thanks for joining YNS Challenge #1! You rocked this challenge! This is one bright and adorable card. Ewww, I will have to try to play along! I got that same stamp you did! LOL. Love this! Perfect for the challenge! Super cute Ashley! Thanks for playing along with us at YNS! super cute! i love pink n yellow together!! I love your card Ashley! 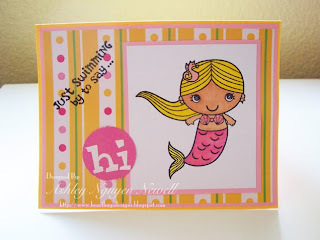 It is so cute and the mermaid looks great in yellow and pink! Thanks for joining YNS! This is totally adorable! Love your coloring and that cute paper! Thanks for playing along with us at Your Next Stamp!